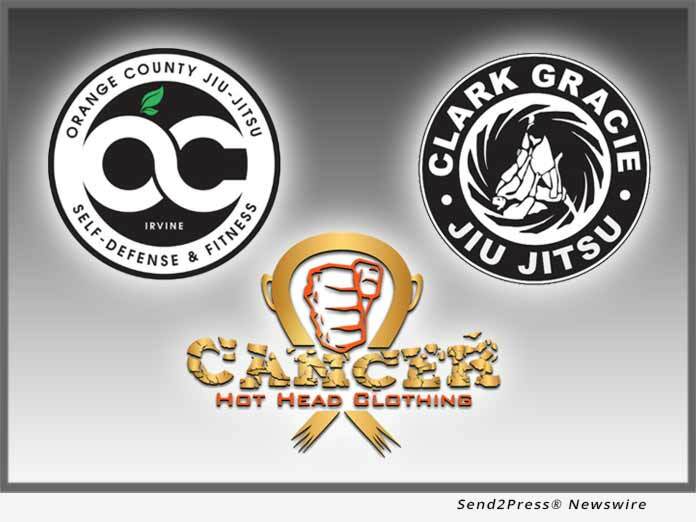 IRVINE, Calif. /California Newswire/ — Orange County Jiu-Jitsu (OC Jiu-Jitsu), a Clark Gracie Academy, and Hot Head Clothing, an apparel line designed solely to benefit child cancer patients, announced that they recently held a unique fundraising event to heighten awareness and raise money for St. Jude Children’s Research Hospital to combat childhood cancer. The fundraising event was inspired by Jacob Sebastian Garcia, a jiu-jitsu student, who was diagnosed with Pre-B Acute Lymphoblastic Leukemia in 2012 at the young age of just three-years-old. Jacob is now in remission but like many children, he continues to battle the after effects of chemotherapy treatment every day. Jacob’s mother and father (Erica and Robert Garcia) observed numerous struggles endured by so many parents of kids with cancer, lots of which do not have adequate insurance to provide effective treatment and becomes very expensive. As a result, they decided to start a fundraising page via St. Jude Children’s Research Hospital, which never chargers parents for cancer treatment or associated medical services. Erica and Robert then teamed with OC Jiu-Jitsu to hold a fundraising event in Sept. during Childhood Cancer Awareness Month. The inaugural event was held at OC Jiu-Jitsu in Irvine, Calif. on Sunday, Sept. 16. A two-hour session was led by Jeff Weins and Budo Jake, who are both accomplished black belts in jiu-jitsu and regularly teach kids the art. They kicked the fun off with kids showing up from throughout Southern California demonstrating their entertaining moves in front of a packed, sold out crowd of supporters in an open mat format. The second hour consisted of a seminar that involved more kids from the Southern California jiu-jitsu community rolling around and demonstrating various moves for the audience. But Jacob’s mother and father didn’t stop there. Their son’s journey with cancer inspired them to establish Hot Head Clothing – a collection of unique shirts, tank tops, beanies and hats designed specifically for child cancer patients, with a portion of the proceeds are donated to cancer research for children. * Every year 15,780 children will be diagnosed with cancer in the U.S.
* The side effects of treatment for cancer can last a lifetime. Treatments invented at St. Jude have helped push the overall childhood cancer survival rate from 20 percent to more than 80 percent since it opened more than 50 years ago. St. Jude vows to not stop until no child dies from cancer. St. Jude freely shares the discoveries it makes, and every child saved at St. Jude means doctors and scientists worldwide can use that knowledge to save thousands more children. The money raised by events like what OC Jiu-Jitsu and Hot Head Clothing recently held helps ensure families never receive a bill from St. Jude for treatment, travel, housing or food – because all a family should worry about is helping their child live. Charity fundraisers help St. Jude Children’s Research Hospital continue to lead the way the world understands, treats and defeats childhood cancer and other life-threatening diseases. Interested parties can make donations by visiting the fundraising page created on St. Jude’s website: http://fundraising.stjude.org/site/TR?px=5004062&fr_id=101470&pg=personal or Hot Head Clothing items can be purchased at its website: https://www.hotheadclothing.com/ and Instagram @hotheadclothing. OC Jiu-Jitsu is located at 2540 Main Street in Irvine, Calif and Hot Head Clothing is located at 2166 West Broadway PMB #197 in Anaheim, Calif. Weins says that he plans to hold future fundraising events in conjunction with Hot Head Clothing and other entities in order to raise money for childhood cancer, but will be looking for a larger venue due to an expected larger turnout. Based in Irvine, Calif., OC Jiu-Jitsu/Clark Gracie Academy was established in 2015 by world champion martial arts expert Clark Gracie, an American Brazilian jiu-jitsu competitor and member of the world-renowned Gracie family. He is the grandson of legendary Carlos Gracie, the founder and creator of Gracie Jiu-Jitsu, and first eldest son of Carley Gracie, the father of Gracie Jiu-Jitsu in the United States. The academy teaches students of all ages honor, respect, discipline, confidence, strength, endurance, strategy, and controlled self-defense. For more information, visit https://www.gracieirvine.com or OC Jiu-Jitsu’s Facebook page: https://www.facebook.com/groups/1883548621938061. Based in Anaheim, Calif., the genesis of Hot Head Clothing was Jacob Sebastian Garcia, who was diagnosed with Pre-B Acute Lymphoblastic Leukemia in 2012 at the age of three. Jacob’s journey with cancer inspired his parents to create a clothing line for kids with cancer, which they dubbed Hot Head Clothing. Children who have cancer must undergo a painful surgery that involves getting a chest port, which is a tube that goes into a vein in the chest direct to the heart. It can be embarrassing and uncomfortable to regularly disrobe in order to receive chemotherapy treatment. Hot Head Clothing created various garments that include custom made zip-down t-shirts, so nurses can quickly and easily access the port. Additional products include beanies, masks, hats, hoodies, tank tops and t-shirts with messages relating to cancer containing eye-catching designs. A portion of sales proceeds go to childhood cancer research. For more information, visit https://www.hotheadclothing.com/ or email support@hotheadclothing.com.